Who doesn’t love cake in a jar? I know, I know. We all do! 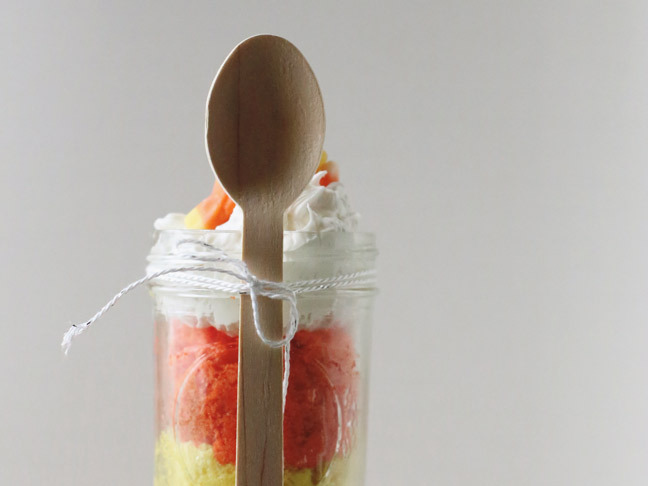 There’s such a novelty when it comes to cake in a jar, because it’s just plain fun. 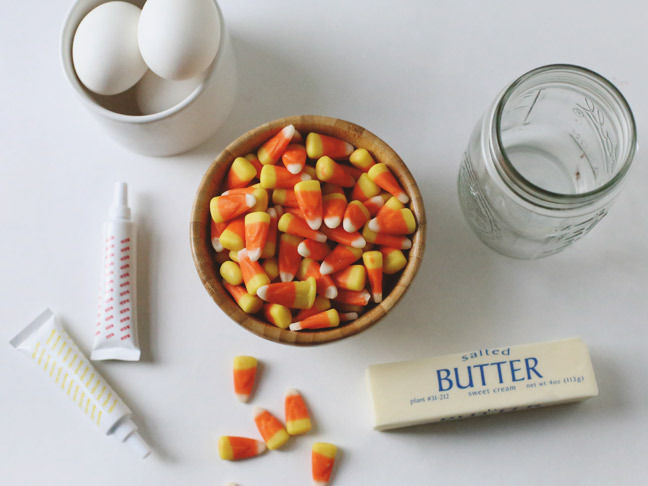 Which is why today we’re making candy corn cake in a jar! No fear. 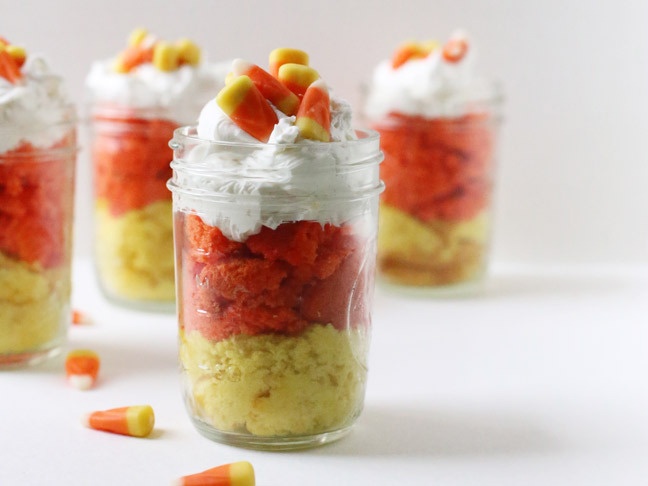 This is so much easier than you think, and it’s perfect for Halloween parties because the mason jar makes for a fun display, while also eliminating the need to cut and serve cake on the fly during a party. Bonus! Cake in a jar also makes for easy transport if your party isn’t at home. Boom. You’ll mix up the batter per the instructions on the back of the box and then split it into two bowls. 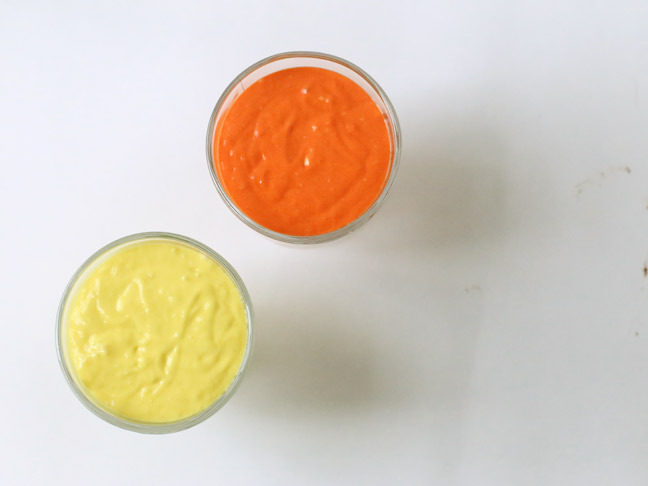 One bowl of batter we’ll jazz up with a bit of extra yellow food coloring to punch up the color, and the other we’ll mix with yellow and red food coloring until it turns the perfect candy-corn-inspired shade of orange. So fun. So easy. 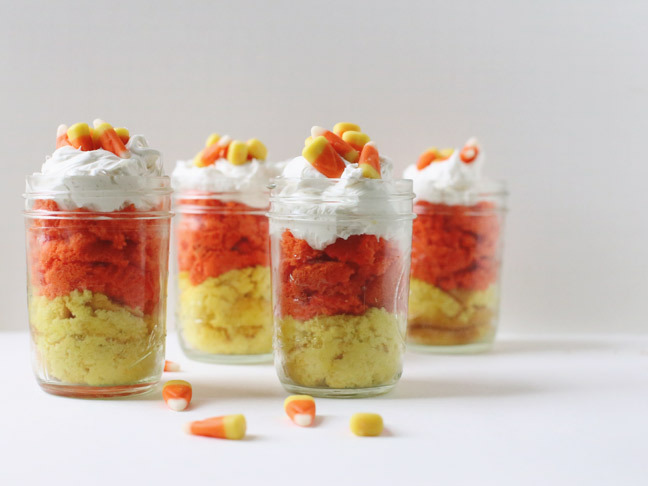 When all is said and done, you’ll have these super fun and awesome candy corn inspired cakes in a jar. I like small jam jars, but larger mason jars work, too! Or reuse old pickle jars—that’s totally cool, too. So let’s do this, okay? Okay! What's cuter and more delicious than those adorable little candy corns? These cakes in a jar! Step 1: Begin by mixing your cake mix per the instructions on the package. Once it's prepped and mixed, split the batter in half and place each half of the batter in a mixing bowl. This is also when you'll preheat your oven to the temperature specified on the back of the package for cupcakes. For my mix it was 375°F. Step 2: In one bowl of batter, add a few drops of yellow food coloring. How much you need will depend on your particular food coloring and your desired shade of yellow. Mix thoroughly. Add more food coloring, mix, and repeat the process until you achieve the desired shade of yellow. In the second bowl, add equal parts of red and yellow food coloring and mix. Repeat, adding yellow and red, until you achieve a nice dark orange color. Step 3: Line a muffin pan with cupcake liners and fill each cup a little over half full with batter. You'll want to have roughly the same number of yellow cupcakes as orange cupcakes when all done. Step 4: Bake for 14-19 minutes or until a toothpick inserted into the middle of a cupcake comes out clean. Remove from the oven, allow to cool for a few minutes, and then move cupcakes to a wire rack. Allow them to cool completely. Step 5: Once completely cooled, remove the cupcakes from the wrappers---it's time to assemble! Begin by breaking up a yellow cupcake and placing it at the bottom of your jar. I like to use approximately 1½ cupcakes per layer. Follow up with orange cupcake on top. Add a generous dollop of white frosting on top and garnish with candy corn.